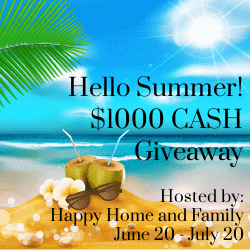 Diva Fabulosa is hosting the Hello Summer Cash Giveaway and one lucky person is going to win $1000! The giveaway is open worldwide and ends 7/19. Visit Diva Fabulosa to enter the giveaway! I would love to win some summer cash to pay down on my bills and update my wardrobe .Thanks in advance Happy Summer Everyone. thank you for the chance at such a great giveaway. i love the products. if i won i would take my family on a vacation to either Yellowstone National Park and Chico Hot Springs. The adults children in my family grew up in Wyoming and Montana but their children have never been there. it would be wonderful to pass on that tradition. Would love to win the summer cash giveaway since I will need to move to the East Coast from the West Coast due to medical issues.